Happy Monday everyone, I hope you are ready to start a new week! I am having a hard time today. I spent last week on the mountain with some youth from my church. It was a wonderful experience to be a camp leader for those amazing girls! Even though I missed my sweet kids, it was hard to come down off that beautiful mountain and away from the lovely fresh air. I did enjoy the opportunity to wear my striped hipster beanie since it got a bit chilly at night, but since I am back to 100 degree weather, I am sharing a non-wearable today: a super chunky wool rug. 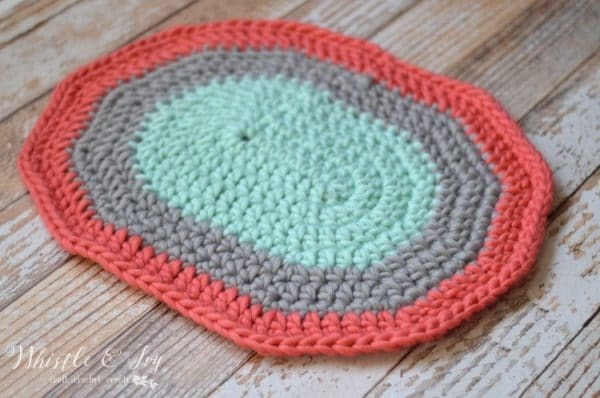 This pattern is very simple to make. However, pay attention to the type of stitches for each row. 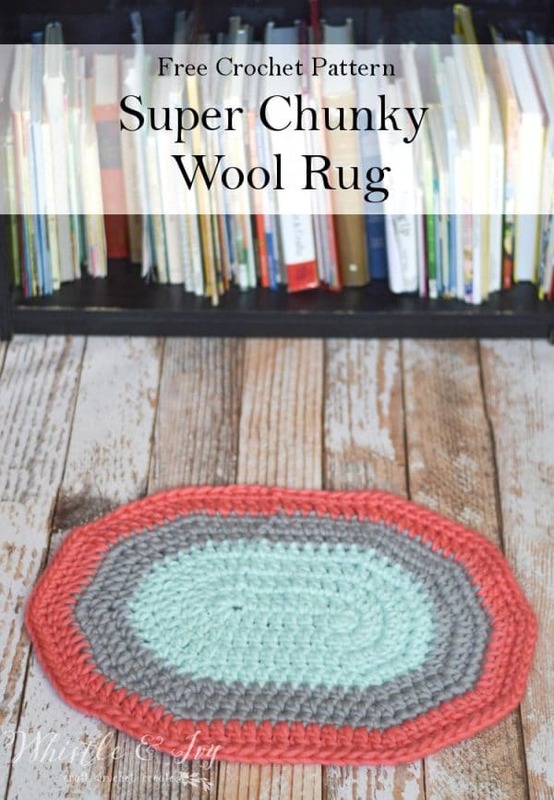 I wanted to maximize the yardage for each skein so no yarn is wasted making this rug. * * – repeat the instructions in between the asterisks the indicated number of times. Note: To make the color changes more seamless, finish the last stitch of the round with the color you intend to start. For instance, if your last stitch was a dc, you will work all the steps of a dc stitch, but finish the stitch by grabbing your second color and pulling it through for the last step, then join with a sl st using 2nd color, which you are now using. This is optional, but definitely makes the seam look nicer. Start with 1st color and begin with a ch 10. Ch 2 (1) at the beginning of the round, and the slip stitch at the end do not count in the row count. From here you can weave in your ends and tie off, or you can keep going and make your rug as large as you would like! Keep in mind, each row will take more yarn than the previous row, so calculate that in when buying your yarn colors. I hope you enjoy your new super chunky wool rug, it’s so squishy under your toes! 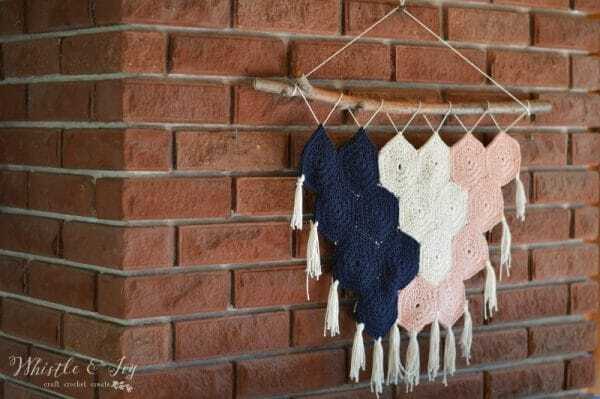 I think I will be making one for Sis’s room when I can decide on a color scheme. 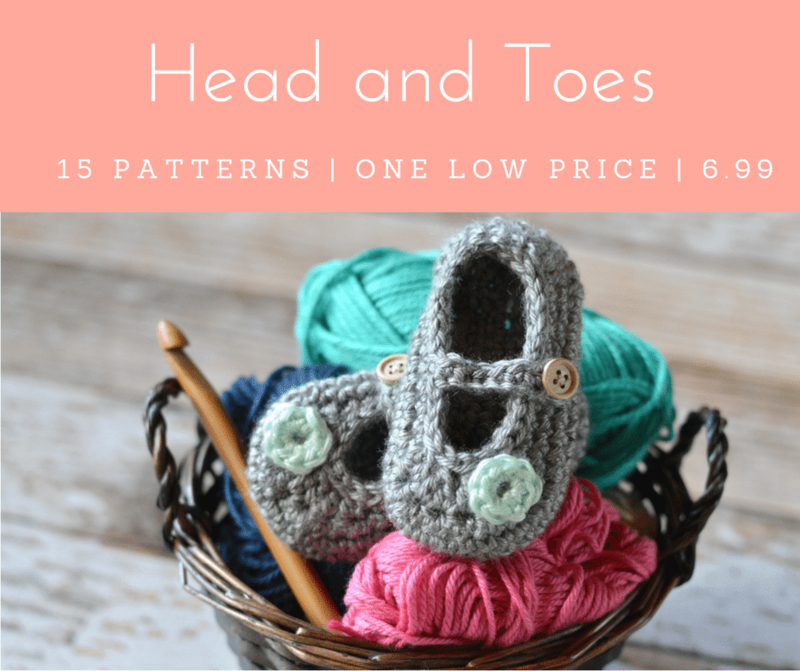 Like this free pattern? Subscribe! That would be a completely different pattern, so I couldn’t explain on-the fly, however I will put that down as a pattern suggestion for the future! Thanks for the pattern. I made a rectangle one with giant knitting needles my Dad had made out of a broom handle. He’s made me a crochet hook too now so will try it. 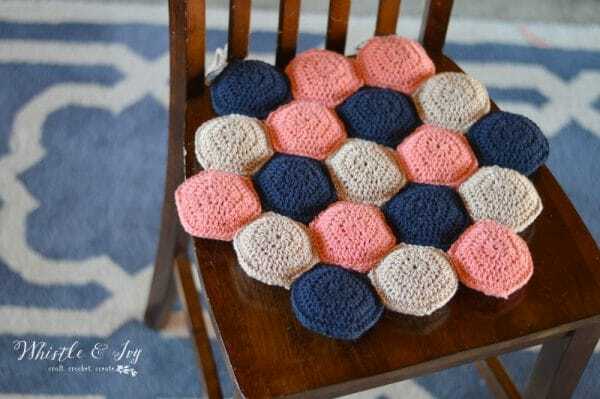 If I do half of each round will I make a half rug for the hearth? Yes, if you turn when you work half instead of working all the way around you will have a flat top. Good luck, that sounds like fun! I love your ideas and patterns! I have so much yarn stash that I’m always looking for odd projects. 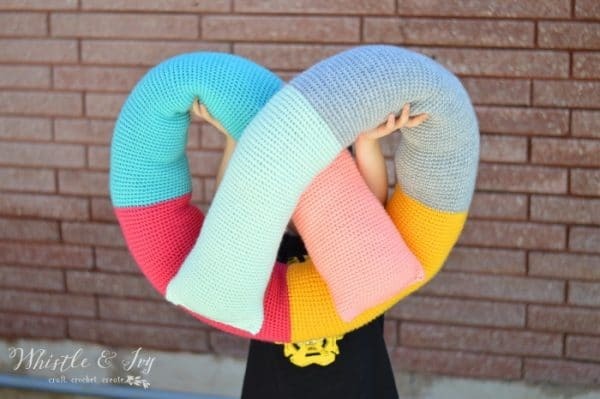 Would this work using two strands of Rec Heart Super Saver? Thanks so much. Yes you could! The sizing might be a bit different, but you could continue and make your rug larger if you want to to make up of for it. I like this pattern!! I have bags and bags full of old sheets and other material too thin to reuse as clothing.. 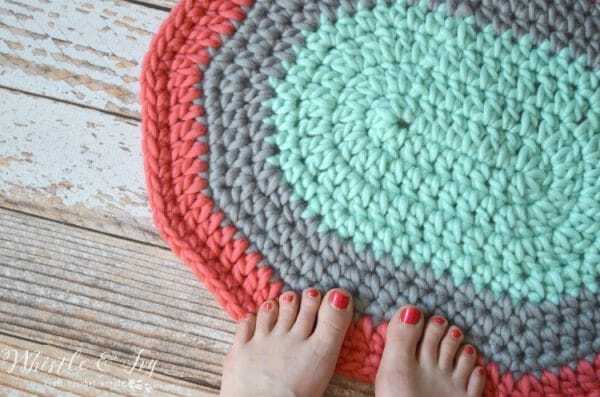 I keep trying crochet rugs out of them. My kids told me my oval had issues. lol I’m going to try this. Thank you! Lol! Well I hope this helps you! Old sheets would be a wonderful idea! 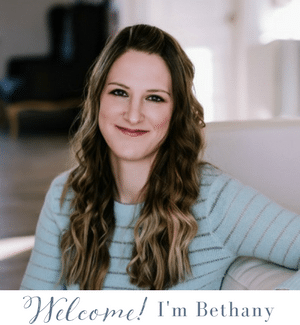 Hi Bethany, thanks for sharing such a great pattern! I want to keep going past Row 9 for a larger rug but I wasn’t sure which stitch pattern (ie sc, hdc, dc) or repeat of rows I should do? Do you have any suggestions? Hello! I changed up the stitches in order to make the yardage go farther. For instance, I only had 3 yards of coral left, which wasn’t enough yarn to do a whole round of dc, so I did sc instead so I was able to use those last few feet of yarn. If you have a ton of yarn, I would do dc, as the rug will work up quicker that way. This is beautiful! I have not done any crochet crafting since winter time. You are motivating me to get back to it. Thanks for sharing at #HomeMattersParty Hope to see you back! Beautiful, what a great pattern! Thanks for sharing at Merry Monday! I love this pattern! Thanks so much for sharing something using the Tuff Puff yarn. I’ve been eyeing forever and all I could think of making were chunky hats and sweaters, but it is way too warm for that! Is the yarn really soft and feathery, though? Oops, I see it now in the post thanks. Wow!! So cute! Love the shape. What size would you say this is? I want to make one for in front of my sink but I think it might need to be a bit larger.